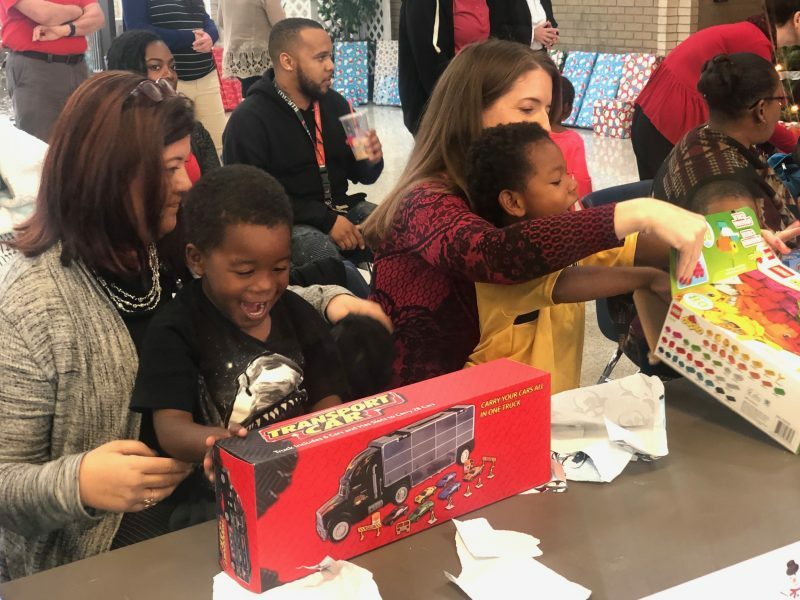 Parents used words — thoughtful, kind, generous and compassionate — to describe Polk County Public Schools’ Kiddie Christmas celebration on Monday, but what summed it up best wasn’t adjectives. It was sounds. Or the gasp of collective astonishment 36 children breathed when Santa Claus entered the room. “We get so much joy out of giving. 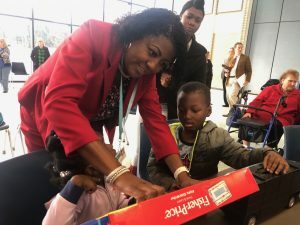 We love to see the joy on the kids’ faces, and it bonds us together as a team,” said Tina Barrios, assistant superintendent of Information Systems and Technology, whose division has organized Kiddie Christmas for more than 30 years. Throughout the year, the IST division conducts multiple fundraisers — including the largest, a silent auction bake sale at the school district’s administrative offices in Bartow — to support Kiddie Christmas. 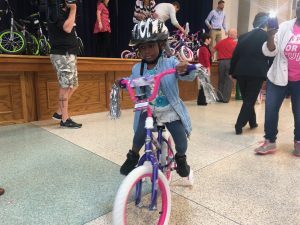 With the money raised, IST employees go shopping, buying each child at that year’s selected preschool program an outfit, jacket, socks, shoes, books, toys, a bike and helmet. They even volunteer their time to wrap the gifts and assemble the bikes. This year, Kiddie Christmas benefited the 36 students who attend the newly opened Gibbons Street Preschool Center. The kids and their parents were told they were going to the Bartow Civic Center for a holiday performance, and yes, the kids sang a quick rendition of “Jingle Bells.” But after a reading of “The Night Before Christmas” by Senior Instructional Technology Manager Kellie Jarrett — aka the “Chief Elf” — the surprise was revealed: Santa Claus had arrived, and he’d brought them all presents. A swarm of high-fives and hugs — and beard tugs, just to be sure — ensued. 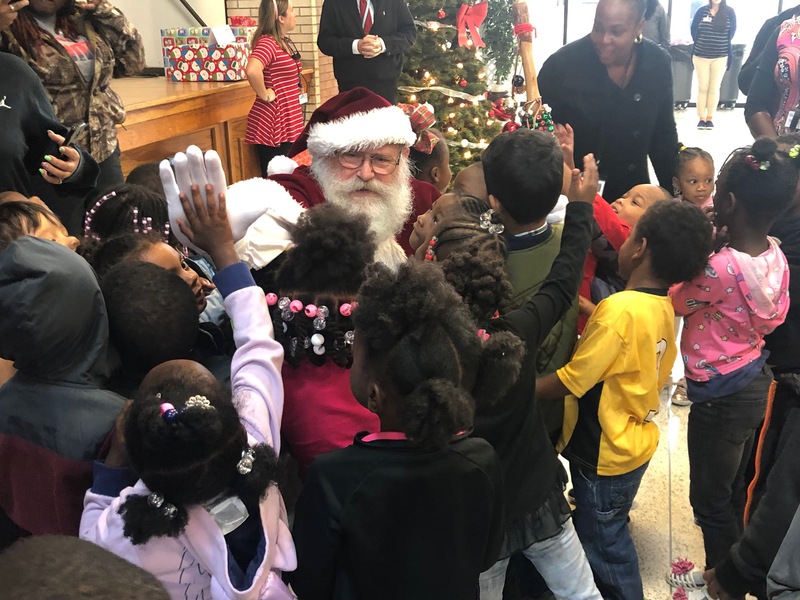 “I was in a store over the summer and I had a woman come up to me and say, ‘Are you Santa Claus?’” said Bill Bucklew, who worked in the IST division for 11 years until his retirement four years ago, but still returns to play Santa at Kiddie Christmas. For the next hour, children were called one by one, to sit on Santa’s lap and receive their gifts. Just when the excitement appeared to be waning, the kids were told to gather for “one last gift.” The curtains on the stage were parted to reveal dozens of bikes with shiny spokes, glittery streamers and a miniature license plate bearing each child’s name. Within minutes, the little ones had donned their helmets and were zipping around the room. Their parents looked on, filled with joy at seeing their children so happy. Watching his 4-year-old son Abram pedal past him, Todd Sims said Kiddie Christmas doesn’t just brighten the season for the children, it offers relief for the parents. Click here for more information about Polk County Public Schools’ preschool programs.